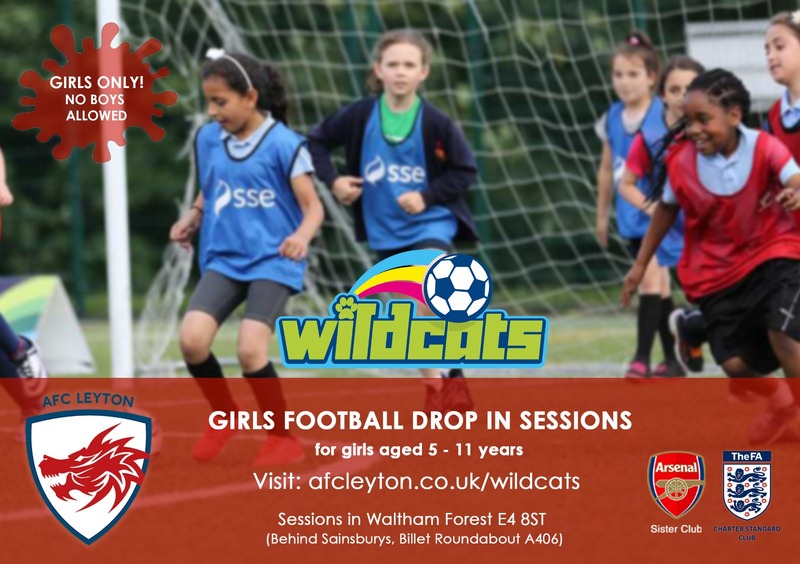 AFC Leyton has teamed up with The FA and SSE to offer girls only football development sessions in Waltham Forest. All girls interested in football and aged between 5 and 11 years are welcome to attend. No need to buy any kit. Just make sure they’re in clothes they can run around in and sports shoes/trainers. Sessions will continue despite the British inclement weather. So, if it’s raining or cold, we recommend the girls wear gloves, thermals and a suitable waterproof coat. The AFC Leyton Wildcats Centre is one of the most successful centres in the country. Please watch our short film about the session. It’s a drop in session, so no commitment required. Just turn up. First 2 sessions are free. Sessions after are £11 per month for 1 session a week or £16 a month for 2 sessions a week. Cancel anytime – giving you access to both the Weds and Saturday sessions (8 sessions a month).